Please contact the restaurant directly for reservations. 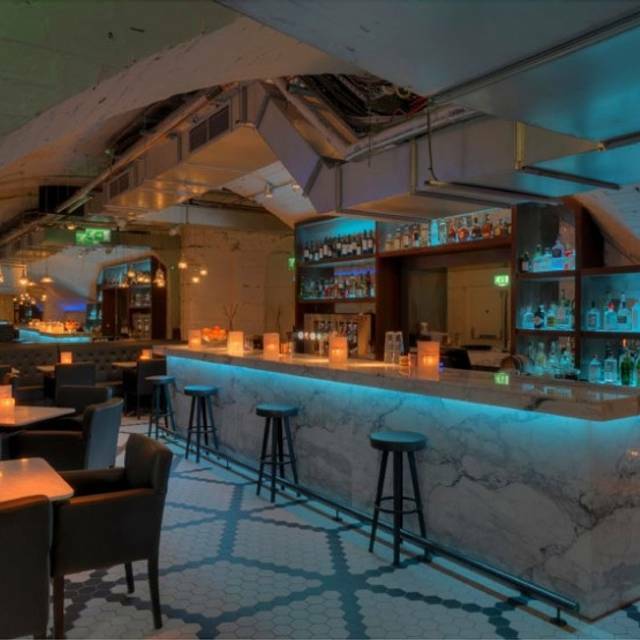 A unique steakhouse & gin bar set in the iconic central station serving only the best quality beef & boasting the largest selection of Gin in Glasgow. 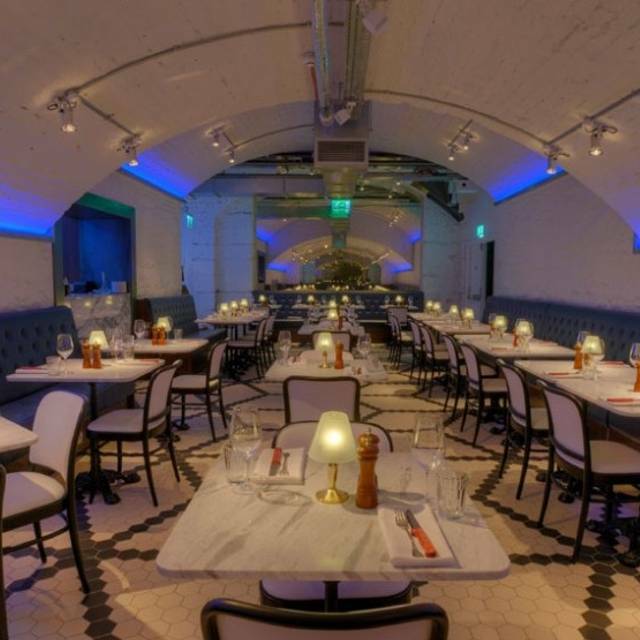 Alston Bar & Beef, named after the long forgotten main street of Grahamston village, is located underneath the Gordon Street entrance of Glasgow Central Station. 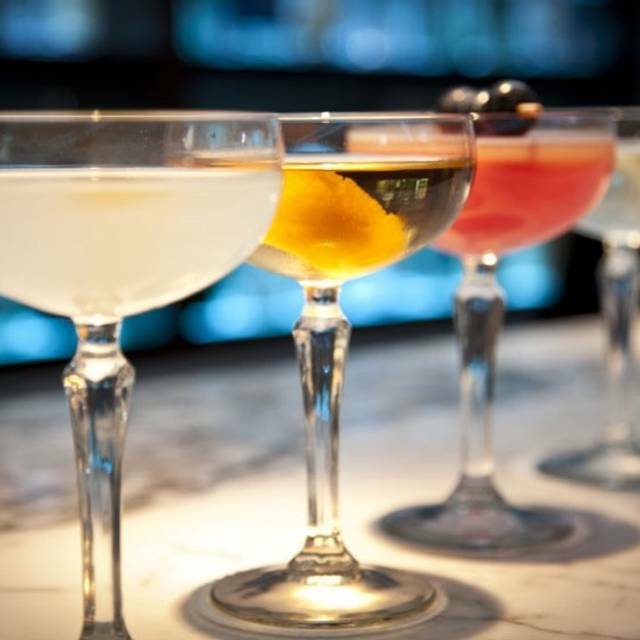 Follow the stairs down to Alston’s underground arches to a bar with Glasgow’s widest range of gin, each uniquely garnished & served to perfection. 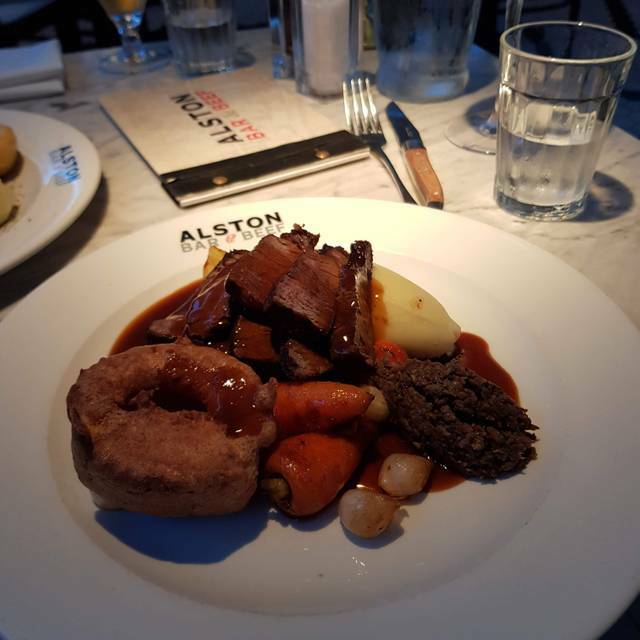 Glaswegians are spoilt for choice when it comes to great places to eat & Alston aims to raise the bar for meat lovers even further by serving the best steak the city has to offer. Choose from a selection of 35 day dry-aged steaks, including the Chateaubriand to share or Glasgow’s favourite, the fillet. All our Scotch beef is carefully chosen from accredited farms each renowned for producing quality beef, full of flavour & tenderness. From a Sunday set roast menu. Steak and Sides Tuesday: Two Ribeye or Sirloin's with two sides and 2 sauces for £45 per couple. From a set menu. Also 1 course for £12. Lovely atmosphere in restaurant and staff very helpful. 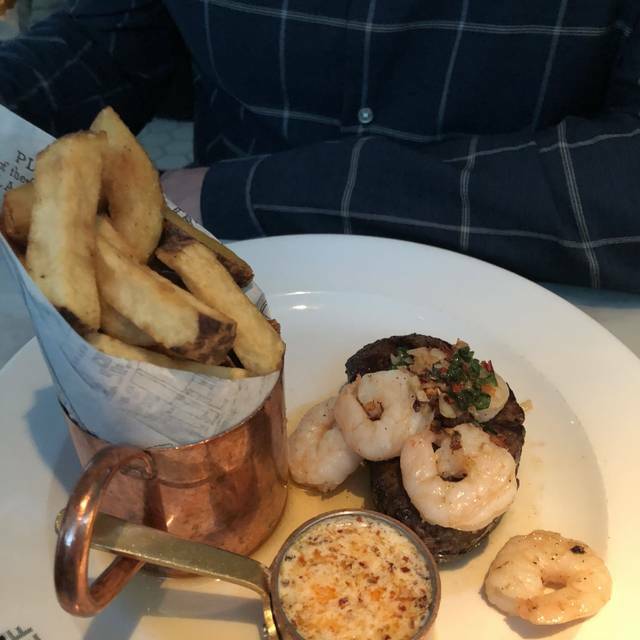 We went for the set menu and the steak was one of the best I have ever had. Great value for money. Will certainly go again. Love this place always visit when I’m in Glasgow, food and service always excellent. A great place to catch up with friends and enjoy some food and wine. 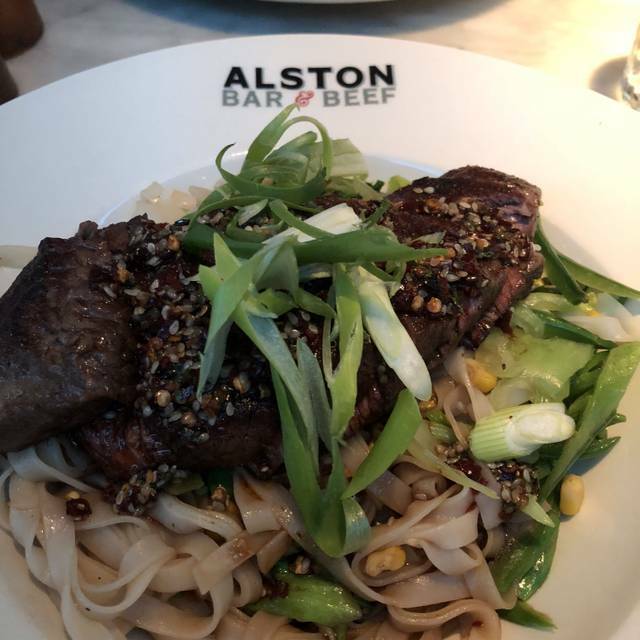 On Saturday we went to Alston Bar and Beef with a first date and we were absolutely blown away. Having been for lunch before I was really looking forward to returning for dinner. Upon arrival we were offered a drink at the bar whilst our table was being prepared and keen to sample something new we asked the barmaid to recommend a gin cocktail which she was really happy to do. We got two different cocktails both of which were delicious and a great way to start the evening. By the time our cocktails were made our table was ready and we were taken through to the restaurant. Although there are no doors between the bar and restaurant there is an appropriate shift in atmosphere. The look and feel of this place is very modern yet cosy because of the arching ceilings and lighting. We decided to share a couple of starters and also to share the Chateaubriand for main. The Chateaubriand was outstanding and was definitely the highlight of the evening as it should be. The quality of the food was exceptional and that was matched by the superb waiting staff. They were attentive without being invasive and were happy to not only make recommendations with respect to the menu but also to use there local knowledge to recommend other local bars we could go to after we left. Overall the cost of the meal was expensive i would say but it was certainly worth every penny and I will definitely be returning and cant wait to do so. Great food, great service. The building acoustics lead to a slightly noisier dining experience. However on this occasion the loudest woman in Glasgow was sitting opposite us. Not the fault of the restaurant whatsoever but it was difficult to hear one another speak. We’ve been before and will be back. Really tasty beef, good sides and a wonderful setting, as well as being so handy for trains! The service was a little relaxed, but also very engaging. I would definitely recommend the Alston Grill to everyone! Wine is served by glass, bottle and carafe, so is perfect for early evening. Meal prior to social event. Staff excellent attentive without being intrusive. Couple of changes requested by companion and carried out without any trouble. I had hake with pomme Anna? however,it was like a turnip. Fish cooked to perfection. Pear crumble excellent. My wife and I absolutely love Alston. The set menu is phenomenal value and the Sunday roast is just fabulous. The quality of food and service is always first class. With its smart interior and serene atmosphere this is a very cool establishment indeed. There's nothing in Alston that doesn't hit the mark. Highly recommended. Food was amazing and the waiter was really attentive. Best Steak in ever. Fab restaurant with great service and food. Always excited to go. I don't really want to give a review, as I don't like giving negative feedback. Sorry. Probably the nicest Sunday roast I’ve ever had, amazing pear crumble dessert too. 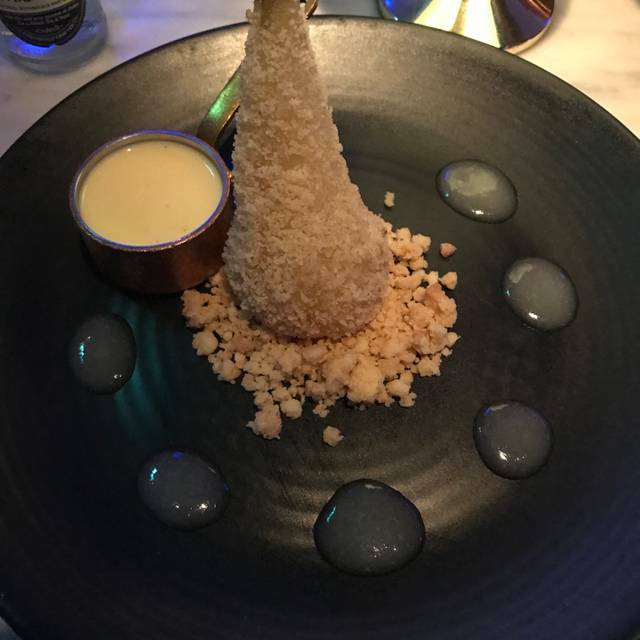 Took my mum for a late lunch and we had a great meal and the staff couldn't have been more attentive without being obtrusive, the food was amazing we both even had desserts which we never do because the food was so nice and we were given plenty of time between courses, would definitely recommend and would go back in a heartbeat. We had a great meal the steak was amazing melts in your mouth. The staff were very efficient and friendly. We were celebrating my Granddaughters birthday and they gave her a small cake with a candle to blow out. Loved the setting so unusual would recommend Alston and would definitely go back. Thank you . Always lovely here - only quibble this time is that we felt kind of abandoned towards the end.. the restaurant was very quiet but staff were not very attentive and, unlike other venues of this standard, no liqueurs or similar were offered after the meal.. 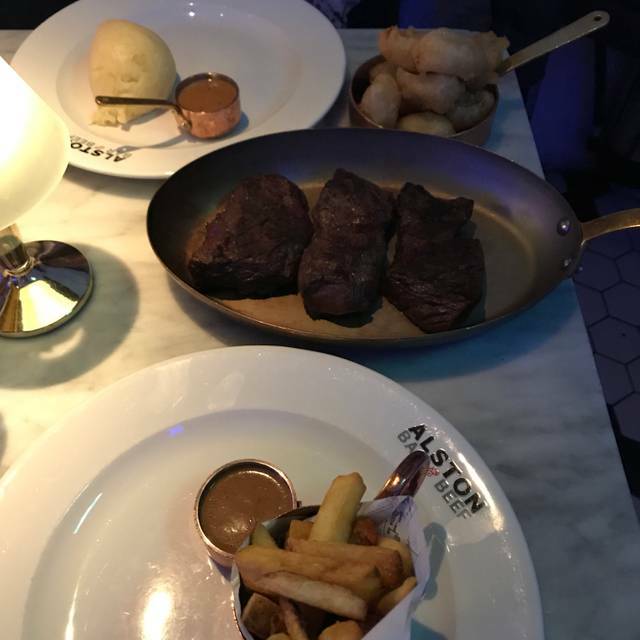 I have been to Alstons a few times with my fiance but went with my family as it had been my Mum's birthday midweek. As always the food was fab but this time we had the BEST experience and it was all thanks to Gary, the fantastic waiter . He single handedly made our visit outstanding. We all absolutely loved him and cannot commend him highly enough. What a fantastic guy!! firstly we were give a table sized for two for four of us. they then moved us. we ordered quite an expensive bottle of white wine, it was warm, never seen a fridge. the starters came and were luke warm. the main course steaks were average. the service was abysmally slow. we mentioned this to the server but she just apologised and that was that. all in all an expensive evening (not much change out of £300) and a very average night out. certainly not worth the hype and price. Excellent food & well priced. Service was very good. Have dined in Alston quite often and enjoy the 2/3 course menu deals. Food is always great value and of high quality. However I thought the menu this time was very expensive. My steak was ok if a bit chewy. Think it would be nice if you could garnish the plate with some sort of veg or salad especially when steaks are so pricey. The mains choice was rather limited . The staff are lovely and very attentive. The ambiance is great. I don’t think i’d eat from The a la Carte menu again as I didn’t think it was value for money. Love this place from bar to restaurant. Easily my favourite place just now. Steak and sides delish as always. My steak delish, sides great but would love to see the mushrooms previously on the menu come back as opposed to portobello with pesto. Would also like to see the addition of some extra sides too! But the battered onions and roast cauli cheese are superb! I am a skinny fries person so would love to see straw fries on the menu too but I am just being picky! 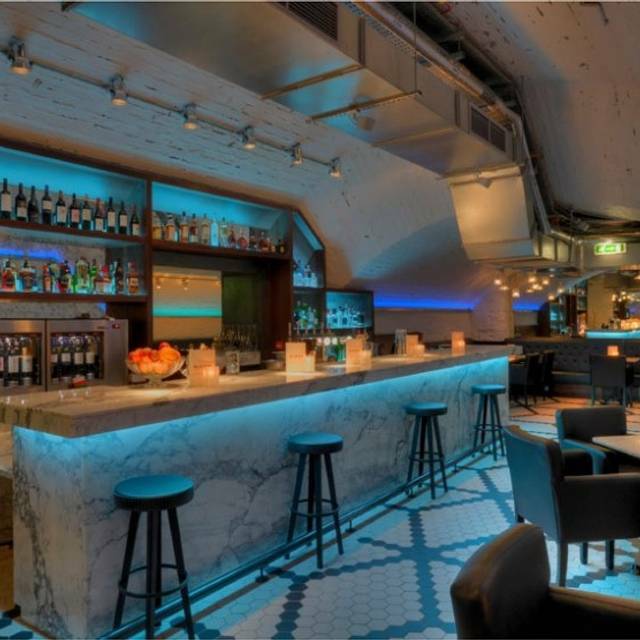 Bar area superb - I do like a perfect serve - bar staff knowledgeable and always friendly. Will be back soon!! It is fast becoming our favourite place. Great value for money, excellent tasting food and attentive service all make this place a must. The beef was amazing!! Even the vegetablea were good! Lovely ambience, cool place. My husband and I picked the restaurant online because it was close to our hotel. It was a real find, we thoroughly enjoyed our meal and will definitely eat there again next time we are back in Glasgow. The food was delicious only complaint about it was the it could have been hotter. Ordered tea but had to send it back. Mine had a metallic taste and my friends water had not been boiled. Best Sunday lunch I have eaten in a long time. Roast beef cooked to perfection, accompanying vegetables sublime. Very, very tasty and satisfying meal. Can't wait until I am in Glasgow again to go back! Overall I'd give it another shot. Had an enjoyable time. Been before and expected class as always. Went for a bigger cut of steak and was blown away with the meat it was unreal!